Major Archbishop Sviatoslav Shevchuk, of the Ukrainian Greek Catholic Church approaches the altar during the Divine Liturgy at the 64th Holy Dormition (Assumption) Pilgrimage in Sloatsburg Aug. 12. Cardinal Dolan acknowledges the greeting by Archbishop Shevchuk. The Sisters Servants of Mary Immaculate, who hosted the event, carry their banner in the procession. A young woman kisses the tapestry of “The Falling Asleep of the Mother of God” at the pilgrimage. Major Archbishop Sviatoslav Shevchuk discussed the greatest gifts of the Ukrainian Greek Catholic Church in his homily to several thousand Ukrainian Catholics during the Divine Liturgy at the 64th Holy Dormition (Assumption) Pilgrimage hosted by the Sisters Servants of Mary Immaculate in Sloatsburg Aug. 12. “That eternal life, can we consider as the treasure? 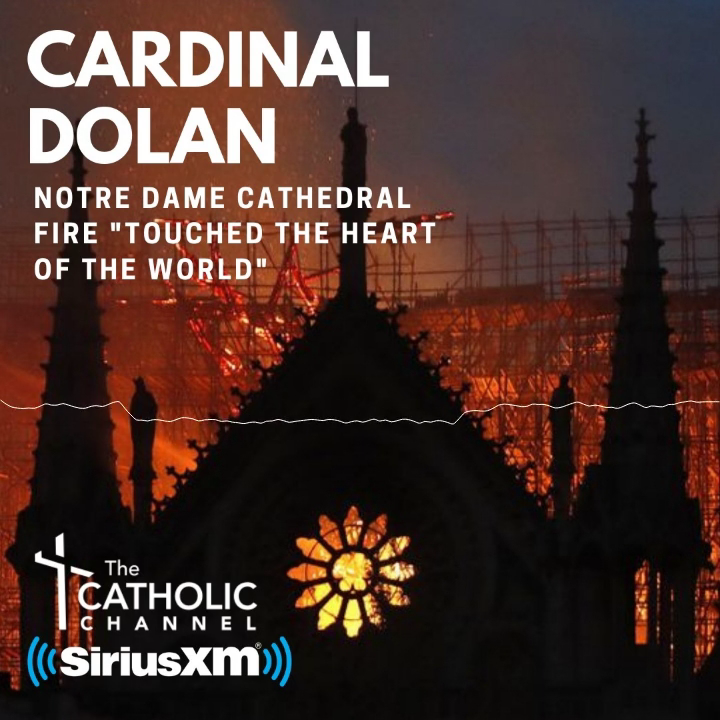 It is possible to have a treasure and a heaven,” the leader of the Ukrainian Catholic Church said to the guests, including Cardinal Dolan. Major Archbishop Shevchuk, the spiritual leader of the Archeparchy of Kiev, served as celebrant and homilist for the two-and-a-half-hour liturgy that included a procession with banners representing Ukrainian Catholic parishes from Long Island, Syracuse, Rochester, Connecticut, Massachusetts and Maryland. The Sisters Servants of Mary Immaculate, who serve the Ukrainian and Ruthenian communities around the world, have hosted the two-day retreat averaging 4,000 visitors on the weekend before the Feast of the Assumption since 1954. The pilgrimage includes confessions, anointing of the sick, blessing of religious articles, blessing of cars and buses Stations of the Cross, blessing of cars and buses, and activities for children and Masses on both days. Major Archbishop Shevchuk, the leader of more than 5 million Ukrainian Catholics, is visiting the United States from a war-torn nation, where fighting has claimed many civilian lives. Major Archbishop Shevchuk, 48, delivered a 15-minute homily in Ukrainian, briefly mixing in English a few times. He reminded the pilgrims “to leave behind you everything which is not helping you move in this pilgrimage” before giving his final remarks in English. “On behalf of our church in Ukraine and worldwide, let me express our gratitude to you, our people of God, for treasuring the biggest national treasure of our Church and our nation, the Christian faith,” he said. Sister Kathleen Hutsko, S.S.M.I., provincial superior of the Sisters Servants of Mary Immaculate, said hosting Major Archbishop Shevchuk and Cardinal Dolan made this a “momentous” event. “It is a historic event for our community,” she said. Helen Turyk and Nadia Marc, parishioners of St. Nicholas Ukrainian Catholic Church in Buffalo, drove down and stayed for both days of the pilgrimage. Ms. Marc, born in Germany and the daughter of Ukrainian parents who were held in concentration camps in Germany, recalled seeing Major Archbishop Shevchuk in Niagara Falls, Canada, in February 2017. Ms. Turyk was born in Buffalo to a Ukrainian father and Canadian mother. She said she was “very excited” to participate in the pilgrimage. Ms. Turyk has visited Ukraine several times in the last 10 years. “You know it’s kind of strange sometimes I feel more at home there than I do sometimes visiting other countries,” she said. Pete Mychalko attended the Mass with his sons, Stefan, 15, and Michael, 12. They are parishioners of St. Nicholas Ukrainian Catholic Church in Passaic, N.J., and residents of Paramus, N.J.
“It is special to be here with my sons,” Mychalko said. “It’s something I’ve done with my parents and now I’m sharing with my sons. Michael was visiting the grounds in Sloatsburg for the second time, but did not recall much from his first visit because he was so young.